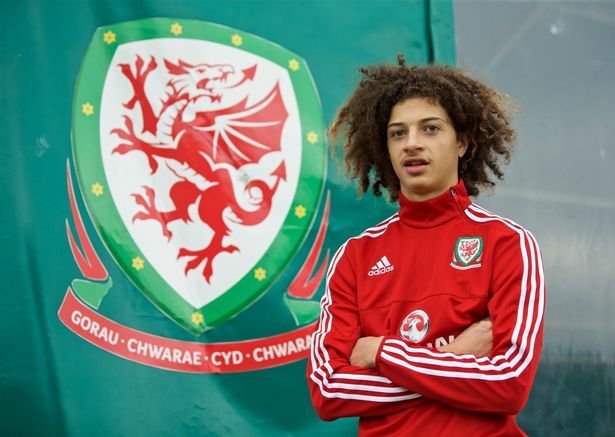 Ethan Ampadu is a tremendous prospect for Wales. He’s still only 17 (his 18th birthday is this week) yet he has the confidence and bearing of someone much older, dictating and directing operations from the deep midfield nerve centre with the swagger and assurance of a seasoned maestro. He can tackle and pass, he has pace and power, and he’s got the quick-thinking creativity and unteachable intuition of the natural-born footballer. On top of all this the Chelsea player chose to be Welsh (via his mother) when he could have picked England, Ghana or Ireland, and he cuts a fabulous figure with his nonchalant grace, elegant athleticism, elfin youthfulness and those dreadlocks. I’ve always adored dreadlocks. I suppose it’s a generational thing, ingrained long ago by my love of reggae in general and Bob Marley (1945-1981) in particular, and underlined by the indelible association of dreadlocks with counterculture, rebellion and rejection of mainstream conformity (not to mention ganja!). I don’t suppose these were factors in Ampadu’s hair-styling choices, but still see them as some sort of evidence of originality, spirit, intelligence and heightened awareness – soppy idealist that I am. In the two Nations League matches played by Wales this week he was excellent, even allowing for the penalty he conceded against Denmark. On that topic, it really is about time FIFA and the International Board which makes soccer’s rules (on which the FAW has a permanent seat) sorted out the increasingly nonsensical implementation and interpretation of the handball law by referees and match officials. For a start the word is handball, not armball, and a hand is that thing with wiggly appendages on the end of your wrist. And secondly the law explicitly says that the handling must be deliberate, not unintentional. On both counts penalties are incorrectly given over and over again by weak, attention-seeking refs, as happened to Ethan Ampadu in Denmark. It was probably his worst experience so far in a football match, and his charmingly bemused toleration of the injustice only increased my estimation of his character. The 2-0 defeat at Ceres Park, Aarhus – Wales’ first appearance in Denmark’s second largest city – brings the overall record against the Danes to Played 9, Won 4, Drawn 0, Lost 5. To stand any chance in UEFA’s welcome new Nations League revamp of what previously would have been friendlies, that record will have to be brought back to parity in the return fixture next year. The 4-1 win over Ireland in Cardiff three days earlier, in which Ampadu imperiously ran the match with languid authority, had got the Nations League campaign off to a good start. It’s important not just for ranking points but also because it can provide backdoor qualification to Euro 2020 if the qualifying campaign beginning next year fails. It was also important to end the terrible run against Ireland, culminating in last year’s shattering defeat that kiboshed World Cup hopes for another four years. Wales had gone eight games without beating Ireland, a sequence that stretched back to 1992. The overall record is now Played 16, Won 6, Drawn 4, Lost 6. Gareth Bale got his 30th Welsh goal against Ireland, increasing his all-time record and beginning to put a bit of distance between himself and the 28 goals of next best Ian Rush. Incidentally, because I was indisposed when Bale broke Rush’s record with a hat-trick against China back in March, there is an arcane statistical point I must make at this juncture – if only to expose the inadequacy of the coverage of Welsh football everywhere else. That 6-0 win in Wales’ inaugural game against the world’s largest country equalled the margin of Wales’ all-time biggest away win: 8-2 against pre-partition Ireland (now included in Northern Ireland’s stats) at the Ulster Cricket Ground in Belfast in 1885. Wales’ 21st match (the Denmark game took the running total to 647) was a real peculiarity. Ireland were actually 2-0 up at half time before early in the second-half Wales scored five times in 10 minutes while getting seven in 19 minutes – a Welsh goal avalanche never equalled since. This included Wales’ fastest-ever hat-trick, notched in five minutes flat by Herbert Sisson (1862-1891) of the Wrexham Olympic club, making his international debut. Including Bale’s in China, Sisson’s is one of only 15 hat-tricks ever scored by a Welsh player. He won three caps, scoring a total of four goals, before leaving Wales a year later to study medicine in London. This turned out to be a disastrous move; he contracted diphtheria from a patient, still fatal in over 10% of cases today, and died in Hackney Hospital aged only 28. The story of Herbert Sisson is just one of the innumerable neglected facets of Welsh football that deserve to be better known. Watch this space for lots more. Meanwhile – don’t cut those dreads Ethan!